You see, Ron Fortier‘s Pulp Fiction Reviews was the first blog I started following when I decided to get deeper into this pulp thing. You’ll find a link in the blogroll here on the right, and Ron’s reviews blog is still my first stop when I’m looking for something to read. Heck, the man has sold me dozens of books! – including a handful that have become my faves. 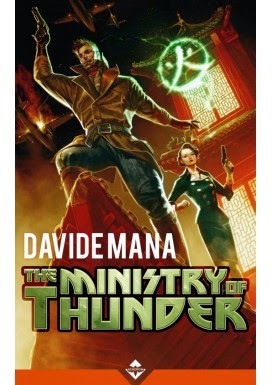 “The Ministry of Thunder,” is a rollicking tongue-in-cheek over-the-top pulp winner that completely won me over within its first few chapters. It’s Indiana Jones meets Bill Barnes with a touch of Kung-Fun thrown in to spice things up. It is the first Davide Mana book we’ve read and we certainly hope not the last. This is more than graduating. This feels like getting a PhD in pulp writing. And yes, I do hope Sabatini will be back, too. Check out Pulp Fiction Reviews‘ full piece about The Ministry of Thunder. Me, I’m throwing a little party. Categories: Other | Tags: Indiana Jones, Pulp magazine, Ron Fortier, The Ministry of Thunder | Permalink.